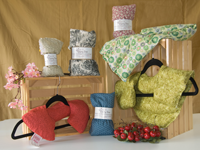 At The Cherry Tree we produce hot and cold therapeutic comfort bags. Our Comfort Bags come in a variety of shapes and sizes to provide relief to all parts of your body. Our bags are filled with cherry pits and are made with 100% cotton and sewn with 100% cotton thread. Our Comfort Bags can be used hot or cold and provide relief from a number of ailments. The bags can be heated using a microwave or traditional oven and cooled in a freezer – please see heating/cooling instructions. Our Comfort Bags are registered as a medical device with Health Canada. Because we are using all natural products, especially the hardy cherry pit, the bags are fully machine washable and dryer friendly. So say goodbye to those other bags that can´t be washed and become dirty and smelly! The Cherry Tree was first established in 1993 and has brought relief and comfort to many satisfied customers since then. The idea of using the cherry pit as a source of heat and cold comes from central Europe and is centuries old. In our busy technology driven world isn't it refreshing to be able to use a natural, time tested product.